How do you identify / classify yourself? Choose as many as you would like from the following and feel free to add to it. Briefly explain why you chose them. I think this is a really interesting/important question to pose to us as students in this program. This was a question I had to ask myself when considering graduate school – when I wasn’t totally sure how to put into words what I enjoyed doing, how to categorize my work, or what I wanted to do when I “grew up”. That’s why I’ve always loved the word “maker” as a title: it’s vague enough to include multiple disciplines, but descriptive enough to emphasize the act of “making”, of creating new things that are tangible or material. I also consider myself both a student and teacher. I always try to learn new ways to make things or express ideas, and try to share my methods and ideas with others. Finally, I would also call myself a designer. I studied Visual Art and Art History in college, and always felt really dissatisfied with my studio art practice. I felt that I was creating things that were briefly shown in a gallery, possibly/passively experienced, and then archived, never to be seen or used again in the real, physical world. Because of this, I chose to study design – where my work would be not only aesthetically pleasing but also functional and purposeful. What is your favorite tool and why? My favorite tool is tape. 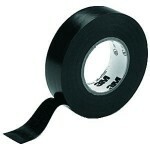 More specifically, I love two different types of tape: electrical tape and gaffer’s tape. Electrical tape is great as a quick, easy insulator for conductive materials. I always have some around whether I’m using wire or conductive thread. It also helps to hold things in place temporarily while I’m testing circuits or making sure I don’t have any issues with short circuits. 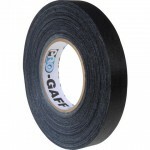 Gaffer’s tape has been my favorite “tool” since I discovered it in my high school photography class. It’s usually used for stage lighting or to secure cords to the floor, a task that it’s great for as it’s similar to duct tape in that it’s super strong, but it can be easily removed from materials without leaving sticky residue. It has a matte fabric backing, making it awesome to use when labeling things or when you want to use tape that looks a little more “classy”. The fabric backing also makes it really easy to rip with your hands (like duct tape). Basically, it feels like it should be this heavy duty, super temperamental / permanent tape, but it’s really forgiving: it doesn’t stick to itself, sticks to (and comes off of!) all sorts of materials, and is durable while also being aesthetically pleasing. I’ve literally used this tape in 20+ different ways and find new ways to use it everyday. 10/10 would recommend this tape to anyone who has never heard of it. It’s great. Go buy it. Reflect on your experience learning a new craft (both independently and from other people in class) and teaching it to other people. Some questions you could address: What did you like about the process? What was frustrating? What insight did you gain? What would you do differently next time? Working with Cathy to learn how to sew using D+T’s Brother sewing machine was way easier than I expected. It’s always daunting to learn a new skill, particularly when you’re faced with learning how to operate machinery as well, but Cathy + The Brother sewing machine + Charles (shoutout!! you’re the best!!) made it so easy! *We’ll be demo-ing how to use it tonight, so I’ll come back to this post to follow up with my thoughts on teaching everyone else in the class how to use it! This entry was posted in Week 5: Learn a New Craft Project on October 6, 2015 by Jane McDonough.